Labor Secretary Hilda Solis will resign. 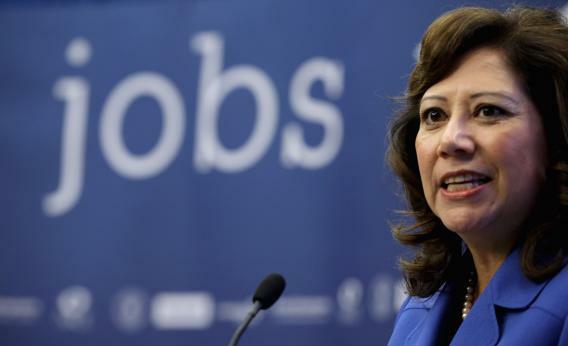 I’m told that Secretary of Labor Hilda Solis will step aside soon, making her the fifth member of the administration to leave the Cabinet (or announce her deparature) since the election. Only two of these departures—Secretary of Defense Leon Panetta and Treasury Secretary Tim Geithner—are white and male. Lisa Jackson, who’s leaving the Environmental Protection Agency, is African-American, and Solis is the first Hispanic woman to take charge of Labor. The White House has faced some criticism this week (a slow news week, generally) for not elevating more women to second-term positions of power. Solis’ departure will only add to that, if only because the secretary of labor was the first Cabinet position to be filled by a woman. That was Frances Perkins, appointed by FDR. Gender politics aside, Solis faced a real fight when she was nominated in 2008. Republicans tried to scandalize her work in the labor movement and accused her of dodging questions during her confirmation hearing. They were, at that time, worried about the Obama administration pushing the Employee Free Choice Act through the Senate; they were aware that the Bush administration’s Department of Labor, run by Elaine Chao, was a model of conservative success. In the end they only mustered 17 votes against Solis, fewer than Tim Geithner got. But Republican opposition to all things Obama has only risen since then. Earlier today, at least two senators—including Jeff Sessions, ranking member on the Budget Committee—swore to oppose Jack Lew’s nomination to run Treasury, despite no trace of scandal around Lew. UPDATE: Here’s the letter Solis is sending to staff. Together we have achieved extraordinary things and I am so proud of our work on behalf of the nation’s working families. It has been more than an honor to work alongside you in fulfilling the department’s mission. Working with all of you as the nation’s 25th secretary of labor, I have come to learn that the work we do every day is indeed a labor of love. We have much to be proud of. In the past four years, more than 1.7 million people have completed federally-funded job training programs; of those, more than one million have earned industry-recognized credentials. In addition, Labor Department investments in our community colleges have expanded their capacity to provide local, flexible, employer-specific job training to millions of Americans, and transformed these institutions into engines of economic growth. Under the American Recovery and Reinvestment Act, we were the steward of more than $67 billion for unemployment insurance benefits, job training and placement, and worker protection. With ingenuity and integrity we ensured that these monies were carefully targeted to maximize job creation so that working people received the help they needed and deserved. We also played an important and active role in crafting regulatory actions to implement key aspects of the Affordable Care Act. Our work will help make President Obama’s vision of a health care system that works for America a reality for millions of people. Leaving the department is one of the most difficult decisions I have ever made, because I have taken our mission to heart. As the daughter of parents who worked in factories, paid their union dues and achieved their goal of a middle class life, and as the first Latina to head a major federal agency, it has been an incredible honor to serve. It has been my privilege to call you colleagues and friends. Thank you for all you have done and will continue to do to make life more just and safer for workers across this country.